It's a spectacular cinematic and colourful universe - created by Monty Python co-founder Terry Gilliam. The iconic director unleashed his extraordinary imagination on Berlioz' masterpiece "Benvenuto Cellini" at the Opera Bastille in Paris. "I don’t do operas I try to put on shows, this is what I try to do." explains Terry Gilliam. "I want it really like it was in the 18th century, it was for the people, it was raw, it was wild and fantastic." "The music is so monumental. It's so big, every which direction. It's heights of beauty and delicacy and the pits of vulgarity and it is tragedy, there is adventure. It is everything. He is a big time filmmaker if he was alive today." Berlioz' first opera is based on the memoirs of the great Renaissance sculptor and goldsmith, Benvenuto Cellini. "It is so grand and unexpected, sometimes you imagine that the phrase will go even further or develop like most other composers and yet he just takes you into another corner." says Pretty Yende. The tale focuses on Cellini's love for Teresa and how he confounded his rival by casting a bronze statue of Perseus in time. "This universe is like Terry Gilliam land." he explains "It is based on illustrations that he designed himself and then they just bring it to life. We have the wonderful event of the carnival which is so exciting to see." Terry Gilliam describes the opera as a 'carnival,' where the world is turned upside down. "The kind of energy, the frenzy, the madness of it which is part of the creative process if you don’t have that you are not going to make great things." he say. "It's an explosion of intense dramatic views that I have never experienced or seen in an opera before." Terry Gilliam sees himself, the visionary composer and the opera's protagonist as kindred spirits. "I identify with them in many ways, because whatever artistic work they have done it has been a struggle and yet the end results have been beautiful so that is my dream. However difficult the struggle is that in the end what you have produced is something wonderful." 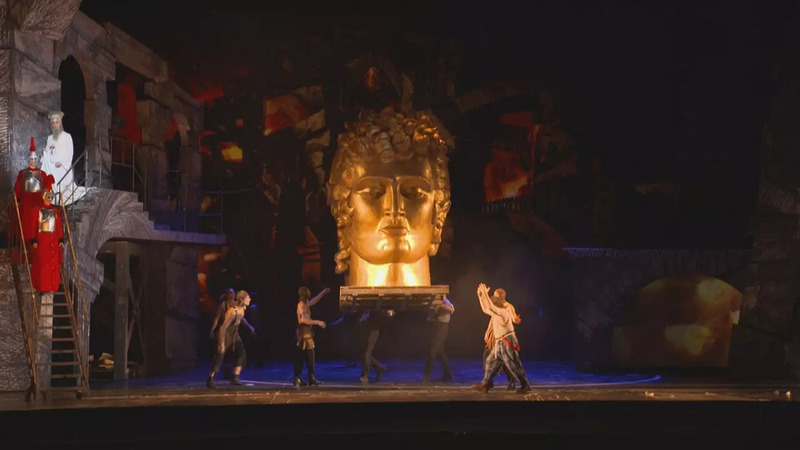 "Benvenuto Cellini" runs at the Opera Bastille in Paris until April 14.